Pascal Triangle « CONSTABLE RESEARCH B.V.
Thermodynamics, the Science of Heat, became an important science in the 19th century when physicists started to improve the Steam-Machine. This blog is about a recently discovered law of Thermodynamics called the Constructal Law. The Constructal Law describes How Intelligent Systems emerge out of the Laws of Thermodynamics. According to Thermodynamics the evolution of the universe has been characterized by an on-going transformation from a simple, restricted, highly condensed, homogeneous state (the Big Bang) to an increasingly complex, widely dispersed, dynamic, multipotent, granular diversity. Energy always moves from High to Low Temperature. This is the main reason why most of the energy of Earth comes from our Sun. With help of the Electro-Magnetic radiation of the Sun we call Light, plants, algae and bacteria transform simple molecules into complex organic structures (Biomass = Potential Chemical Energy) and store the energy of the Sun. Bacteria and Fungi brake up these structures, produce heat, reduce the complexity, and close the Cycle. The Input of the Heat of the Sun has to be compensated by a comparable Output of Radiation otherwise Earth would be burned instantly. The difference between the Input and Output of Energy is transformed into Movements on Earth. The Earth’s climate is a huge flow system. It circulates air and water from the tropics to the poles and back. These flows develop as air and water move from hot to cold regions, a result of variation in the heating of the Earth’s surface by the sun. The Earth is not only heated by the Sun. The hot kernel of the Earth is surrounded by a small crust. At certain places on Earth and the Sea the rotating pool of the magma-ocean produces a lot of energy. The Earth with its solar heat input, heat rejection, and wheels of atmospheric and oceanic circulation, is a heat engine without shaft. Its maximized mechanical power cannot be delivered, but is instead destined to dissipate through air and water friction and other forms of heat loss. It produces maximum power, which it then dissipates at a maximum rate. The earth is wasting a lot of energy because the transmission of most of its energy is not contained in a Tube-like-system. The system maximizes the sum of the work done driving the planetary circulation, and the heat rejected back to space at the cold end of the heat engine. When the speed of the planetary circulation is low, so are the turbulent losses. As speed increases, up to a certain point the sum of work done (circulation speed) and heat rejected also increasing until the turbulence starts to interfere with the circulation and actually decrease the total of work done and heat rejected. That is the point, “the edge of turbulence”, at which the system will naturally run. Every flow system tries to find the perfect balance between movement and friction. The interesting point is that friction is movement in opposition to itself. 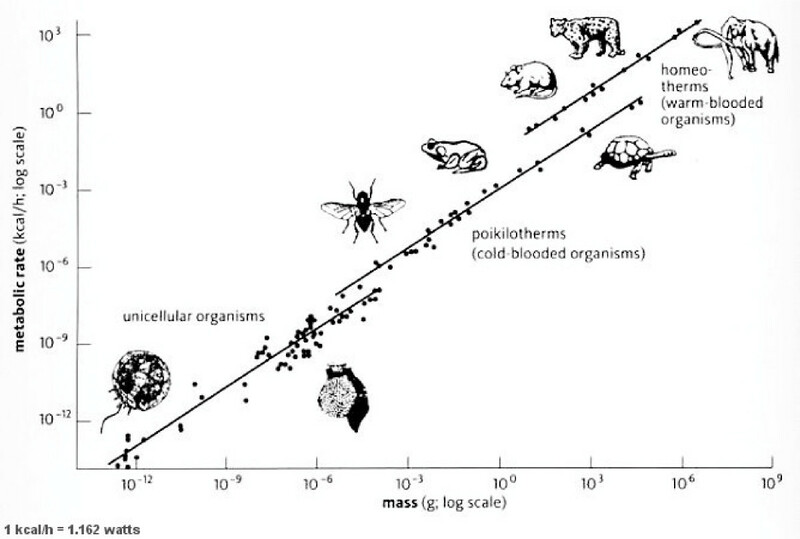 The biomass on Earth is direct or later (Oil, Gaz, Coal) consumed by all kinds of organisms. In Food-Webs Organisms are consumed by other organisms. We, the Humans, describe the interaction of the organisms in the Food-Webs as a Struggle for Live, a Survival of the Fittest, but the flow of energy in the food webs could also be seen as an adaptive chain of chemical reactions that are performed in self-moving, self-reproducing chemical factories. Energy is Potential Movement. The potential energy stored in the biomass on Earth is transformed into circular movement (kinetic energy). During this transformation Heat is produced. 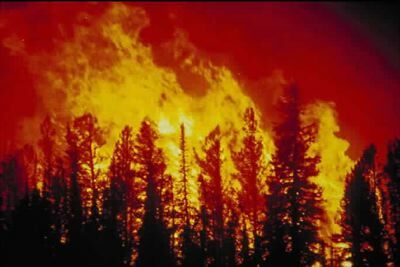 Heat is the waste produced by a restrained non-effective movement. The energy of the Sun produces all kinds of movements on Earth. 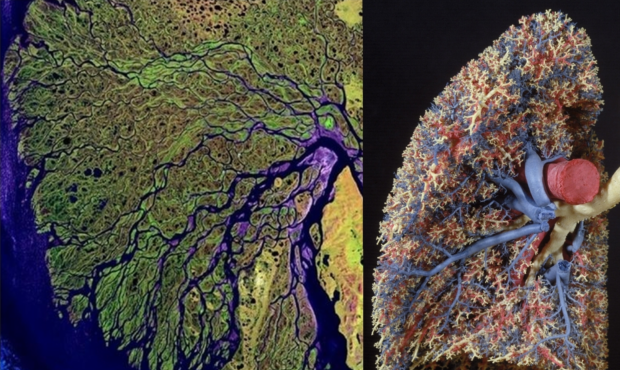 Examples are river-delta’s, our respiratory system and the weather-system. Flow Systems that move from One to Many always look like a Leaf or a Tree. Left a River Delta is shown. Right a picture of the Lungs is displayed. According to Constructal Theory the generation of design (configuration, patterns, geometry, shape, structure, rhythm) in nature is a physical phenomenon that unites all animate and inanimate systems. Design in Nature always shows itself as systems that flow and improve themselves. Systems improve themselves because the movement from chaos to order takes many discrete steps. Biological organisms are flow systems. River basins are flow systems. A Tree is a flow system. The Traffic System is a flow system. The City of Paris is a flow system. The Financial Market is a flow system. The Internet is a flow system. A Proces-Manager is a flow system. All these flow systems must be structured (architecturally designed) in such a way that the currents that flow (Life Energy, Water, Air, Electricity, Gaz, People, Cars, Trains, Airplanes, Content, Money) increasingly get to where they need to go. This gives shape and structure to everything that evolves over time. Flow Systems always remove the Resistance to the Flow themselves. Constructal Law is formulated as follows: “For a finite-size system to persist in time (to live), it must evolve in such a way that it provides easier access to the imposed currents that flow through it.”. 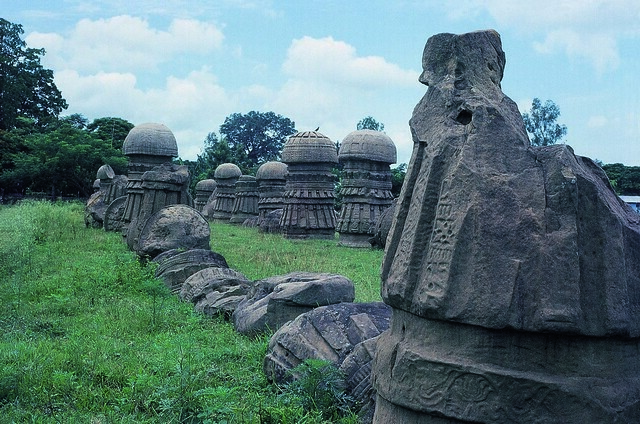 Nature always provides Resistance to Change (Heat, Erosion, Friction) and this resistance is provided by the Systems of the Past. The current Order resists the potential Chaos of Free Moving Energy. The Paths of Change of our Universe always move in the same way. 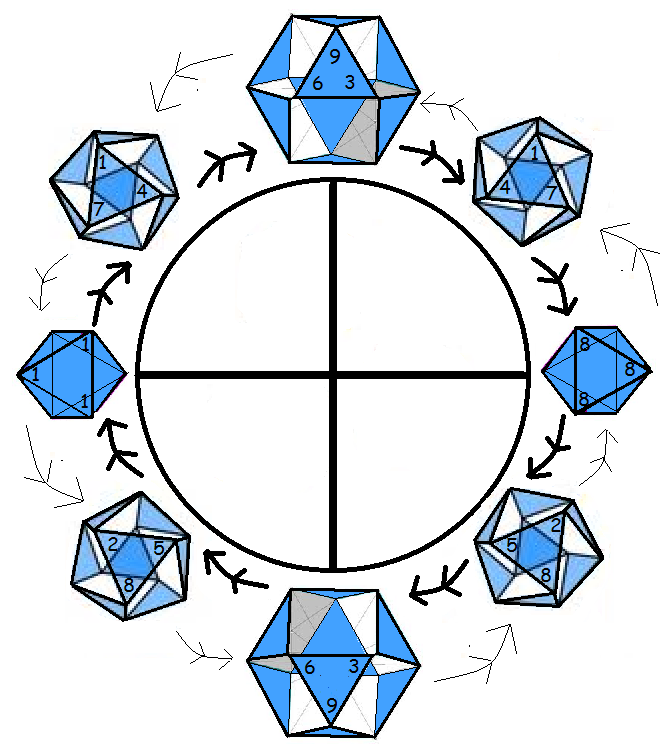 The pattern looks like a Moebius Ring, the number 8, because this is the only way to cope with the polarity of the movements. In a Moebius Ring two Opposite Cyclic Movements are perfectly United. A Moebius Ring is a 2D-structure that operates in 3D because it needs a Twist to operate. According to Constructal Theory the Energy of the Sun creates two types of Systems called Engines and Brakes. Engines are the most effective and efficient states in the evolution of our Universe. They have found the best way to cope with the resistance that is provided by the Brakes. Brakes are the old systems like trees, forests and natural or constructed dams that slow down the movement so the potential energy can be stored. If the Energy of the Sun is not stored, the Self-Reproducing Systems are unable to evolve to a higher level of organization. If every Resistance would be gone the Flow-Systems would Flow in a Radial Pattern to every Direction possible. If we remove the Natural Brakes (Forests, River-delta’s) the Expansive Flow-systems will take over control and the Smart Highly Improbable Next Generation Brake Systems, the Organisms would die. We, the Humans, are here to Resist the Engines that give the Flow-Systems the opportunity to make Everything the Same. Every Thing has to become the Same because the Universe does not discriminate. Every configuration has the same chance to be alive. 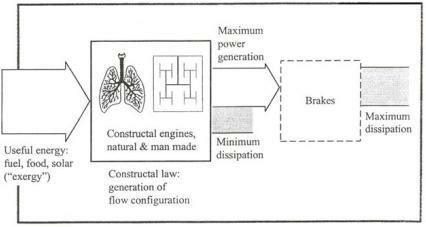 Dependent on the type of flow there are standard solutions to the dualities that are provided by the eternal battle between engine (movement) and brake (not-movement). The standard solution can be calculated using the Laws of Thermodynamics. Tree (or Leaf)-shaped fractal systems are for example the best solution for a One-to-Many (or Many-to-One) Flow. The Flow Systems always converge to these Shapes. Our Earth is rotating, spinning and moving around our moving Sun. The influx of Energy on every area on Earth is changing all the time. This means that every Flow-System on Earth has to adapt to the short term and long term changing Energy Input of the Sun. The stability of a Flow-System, the Resistance to Change, is highly dependent on the Resilience of the System. 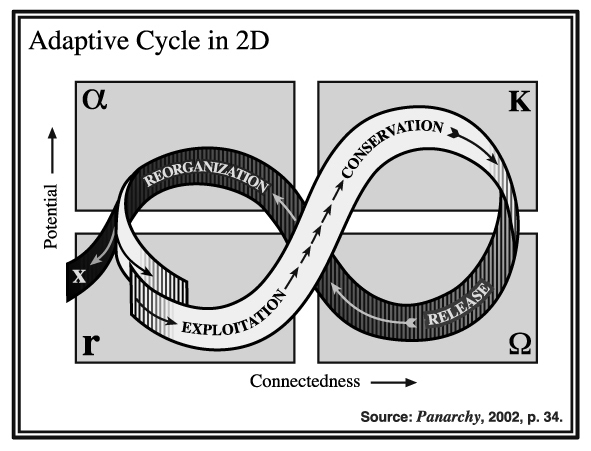 According to the theory of Panarchy the Resilience of a System is dependent on the Potential and the Connectedness of a System. In the Exploitation/Conservation phase of the Adaptive Panarchy-Cycle the Constructal Engines become more efficient (producing more Potential) and Connected. This means that the amount of possible paths in the River-delta of the System is reduced. This amount determinates the resilience of the system. At the state of maximum production and maximum connection (conservation) the system is spending all its potential at self-reproduction and is highly vulnerable to external disturbances. At a certain moment when a disturbance destroys the majority of the paths the system collapses (release). The bits and pieces, the components, of the scattered ecology are reassembled sometimes in a different way (reorganization) and the system starts again most of the time on a higher level of organization. Kleiber’s Law is an example of the Constructal Law. It shows the many levels of organization that have occured since the chemical factories of the bacteria started to work together. Kleiber’s Law can be extented to the level of the Community and the City. The Panarchy Cycle is Self-Similar. It repeats itself on many Scales. The higher the scale the bigger the impact and the slower change takes place. The Scales are interconnected. A huge disturbance on a lower scale (Revolt) can have an huge impact on a higher scale when both cycles are moving into the Release State. A Slow moving High Level Cycle can help to restructure a fast moving cycle by providing the template of the way the components were originally assembled (its CommunityDNA) (Remember). Constructal Law is a Law of Thermodynamics. Thermodynamics has evolved into a Statistical Theory called Statistical Mechanics. To calculate a probability you have to define the Space of all Possibilities of a System, the Phase Space. When you don’t know what a system will look like it is impossible to calculate the Phase Space. To calculate the possibilities of Constructal Law you have to imagine the possible constructions of Mother Nature. It is possible to play with Probability Theory without knowing the exact Phase Space. In this case you have to look at the probabilities of the probabilities. 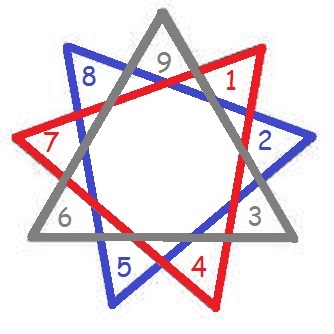 These probabilities are described by the Triangle of Pascal. Behind the Triangle of Pascal a new Triangular Structure shows itself. This pattern goes on and on until the primary Triangle of Creation, the Holy Trinity, is reached. The Trinity is a combination of Desire (Mother, Female, Expansion, FLOW), Control (Father, Male, Compression, BRAKE) and the combination of both Expansion AND Compression also called the Void or the Tao. In Physics the Void is called the Vacuum or the Zero-Point-Field. When we have moved back in time and have reached the state of the Trinity we are very close to the Big Bang. The Big Bang is a result of the Union of the Opposites (Yin/Yang, Male/Female, Matter/Anti-Matter, Expansion/Compression) that both came out of the Void. The Vacuum is the Eternal Flow System of Creation. It contains everything that is possible even the impossible, the Empty Set. According to Constructal Law every finite-size system must evolve in such a way that it provides easier access to the imposed currents that flow through it. The Tao is the Channel of the Energy of Life. If Constructal Law is Right we have to give easier access to this Flow. We have to become the River to move to our final destination, the Sea of the Nothing.